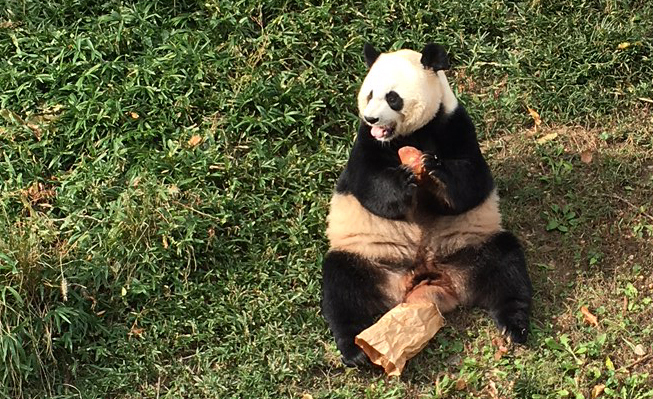 The zookeeper tossed a lunch sack into the panda area at the National Zoo. Inside was a delicious treat. 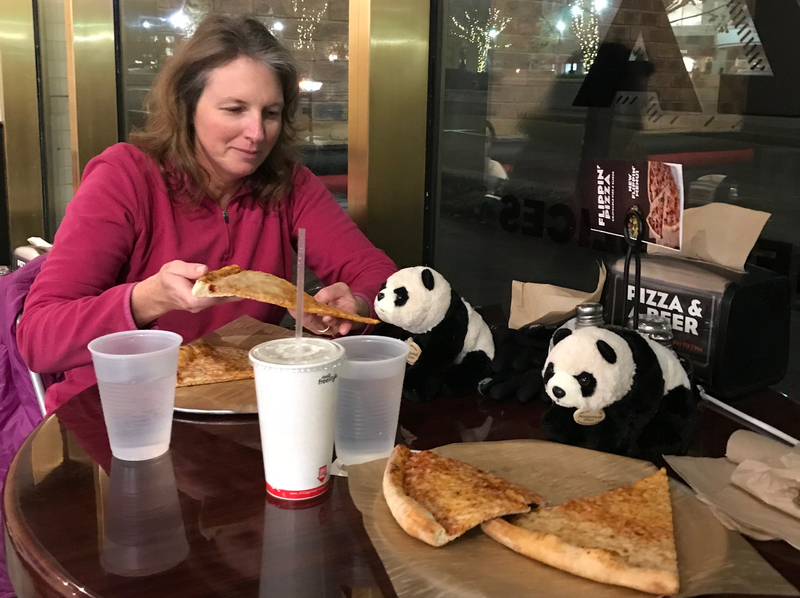 The panda happily opened the bag and let us watch as she savored every bite. In April 1972, the government of China gave the United States two giant pandas (Ling Ling and Hsing Hsing) as a gift following Richard Nixon’s visit to the country. I saw those pandas right after they reached American soil (or so I’m told). I was 5. In return for this gracious fluffy gift for peaceful international relations, we gave China a pair of musk oxen. Really? We couldn’t come up with something better than musk oxen? This week, as is my tradition when traveling for work, I embarked on an adventure in my spare time to see something besides the screen of my computer. As I had not seen the pandas since I was 5, this seemed like a perfect quest. And let me tell you….a simple quest became joyful pandemonium! This guy put on a show for us at the National Zoo. He lumbered down the tree, which we were surprised could even hold him, and promptly tumbled off the last branch, eliciting ooohs and ahhhs from the crowds. 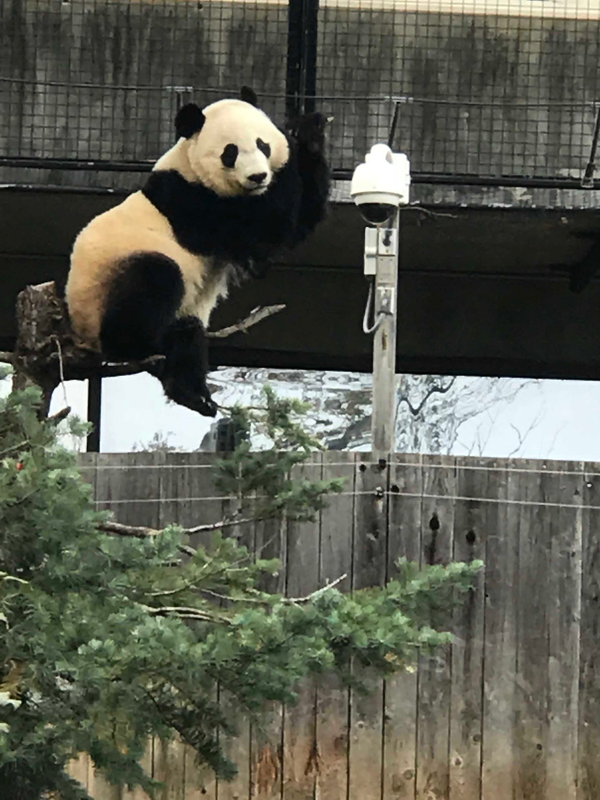 The giant pandas at the National Zoo are delightful and entertaining. I watched one climb, take a dip in the pool, and, best of all, sit in front of me and daintily lick an orange and cranberry popsicle. The experience was so moving, I just had to have a panda of my own. So my colleague and I bought pandas at the gift shop…… and that’s when the pandemonium really started. I learned that many people have misconceptions about pandas. They are actually not lazy. They eat 40 pounds of bamboo a day and that takes walking to find it and a lot of hard work. They also do eat meat at times—they are not strictly bambootarians. They are also not sweet and cuddly. They can be quite aggressive. Armed with this knowledge, we deemed it important to take the pandas out for some fresh air to see the rest of the city and eat! So, after hours of long meetings, we took Chuck and Elizabeth (we gave them American names) out for a walk. And they really enjoyed the sites. 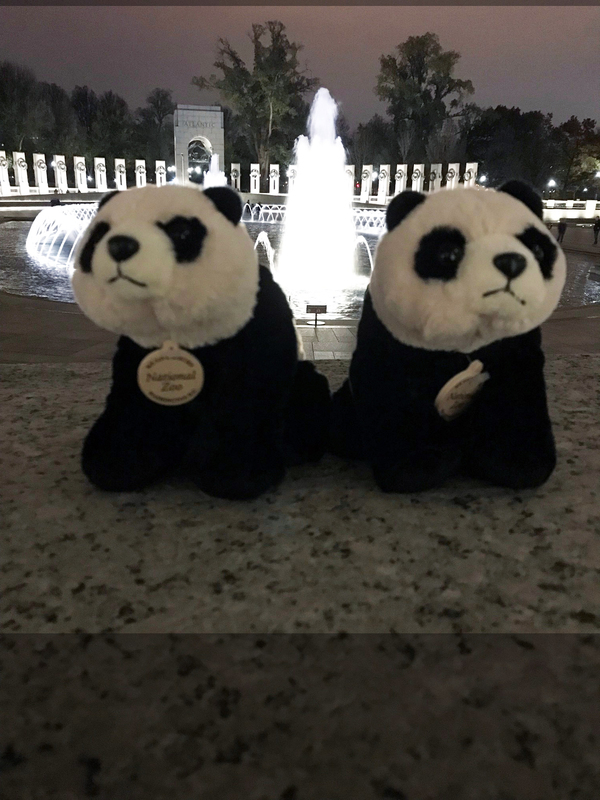 The WWII Memorial was a nice rest stop for the pandas on their first major outing outside the National Zoo. 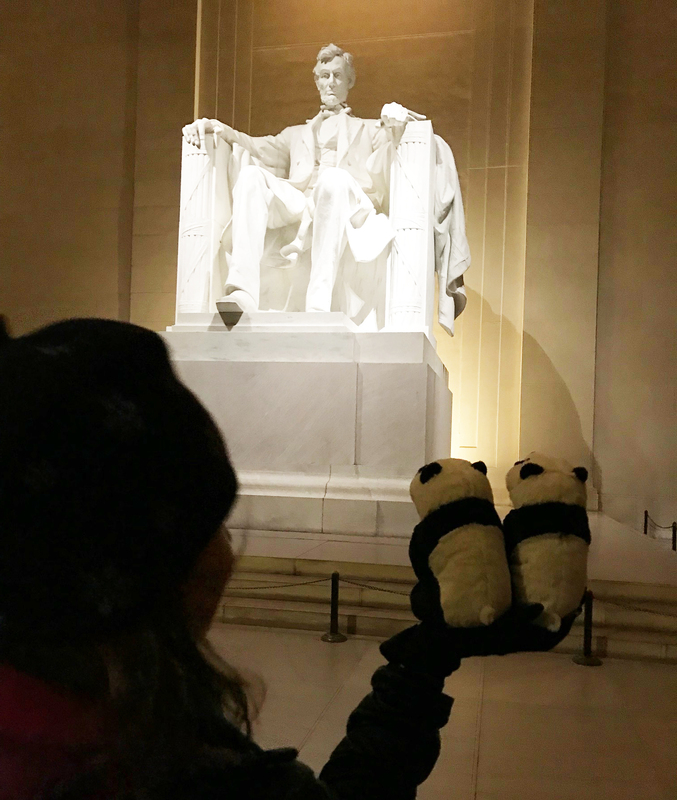 The pandas were very impressed by the scale of the Lincoln Memorial. It’s true! Pandas don’t just eat bamboo. They were hungry after their long journey. 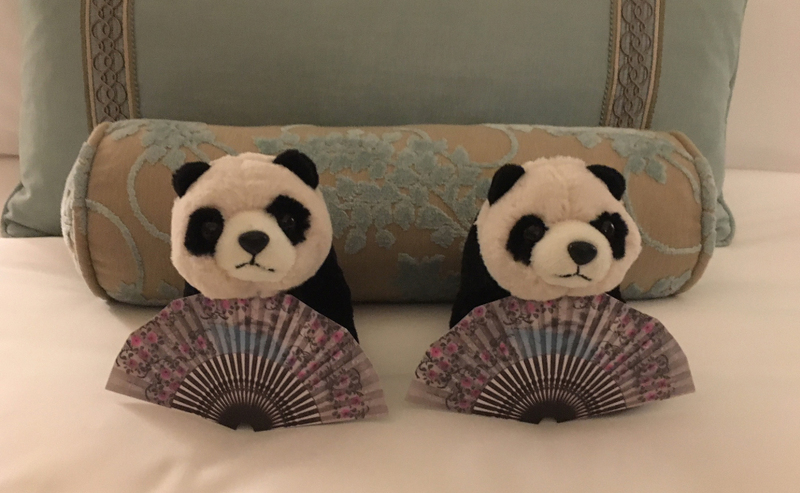 The pandas enjoyed learning about their heritage at the Mandarin Oriental. Thanks for the gift, China. Goodnight, pandas! Ha ha! Bambootarians. I love it.